Definitely a mixed bag out on the water yesterday. Tricos were spotted pool to pool throughout the morning (i.e. 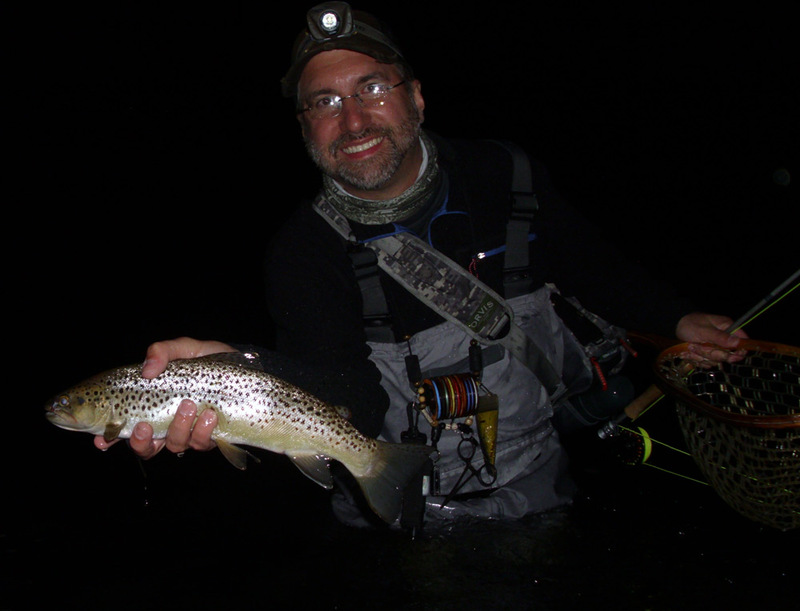 one would fish, another wouldn’t), and then there were good but sporadic olive hatches throughout the day on the West, tapering off in evening once the air temps started to drop. We had a cold overnight last night, which means our bugs will not likely show until later on in the morning today, and with “partly cloudy” skies predicted, we’ll likely be seeing more hebes and stenos in the mid-day than olives. The Isos are starting back up, so they are definitely a threat as well! River levels are steady, and very wadeable, with great clarity out there (just a hint of color!). Looks like it could be a fantastic start to the weekend! Happy Friday the 13th! I hope you aren’t a triskaidekaphobic! We certainly did get quite a bit of rain during the day and overnight, but the good news is that river levels (at least on the West) remained pretty steady – we’re up around 800, but with very little color in the river at all. 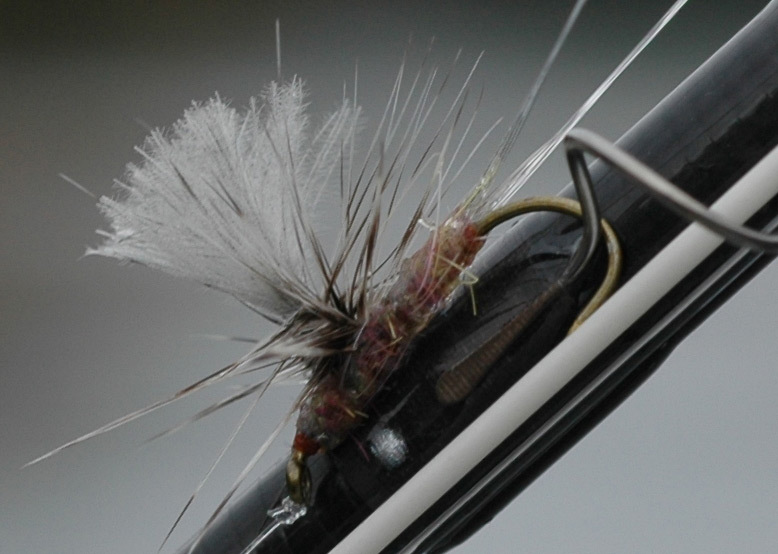 There was a good streamer bite on, with olives and some hebes thrown in for good measure. Today we’re looking at more scattered showers, which means nice, cloudy skies and (finally) cooler temperatures. The air pressure looks to be stable, which is always a good thing for hatching, which means we definitely should have good olive hatches, and maybe even a spinner fall or two, as well as Tricos early on. The 13th is a lucky day afterall, right? Talk about stormy weather! We had some serious thunderstorms roll through starting yesterday afternoon, and not letting up until well into the night. There was a bit more of a sound and light show than torrential downpours, but we definitely did get a good chunk of rain, which bumped up the West, which has already dropped back down again, with very little color in the river by the club at this point. Those that braved the storms (huddling on shore during the lightning) saw very active fish, as well as great hatches of Olives, sulphurs, and Isos. Unfortunately the safe times were few and far between. Today, they are calling for more thunderstorms and severe weather as the day progresses. As per usual, I am skeptical about how bad it will get, but regardless, be prepared out there, and don’t wave a big graphite lightning rod in the middle of the river whilst the sky is flashing! 12 years ago our world changed – please take a moment to think of all of those who selflessly put themselves in harm’s way for our sake. Well, this random summertime weather definitely affected the fishing yesterday, with late in the day FOG being the primary culprit. You know there is a ton of humidity when even the Main Stem gets all foggy and hard to see in the evening! Aside from that, there were decent hatches of olives, stenos, and Isos early in the day, waning as the sun came out, then coming back as evening set in. Today we are looking at a high of 92(!!!! ), with plenty of humidity, and the scattered thunderstorms associated with it. 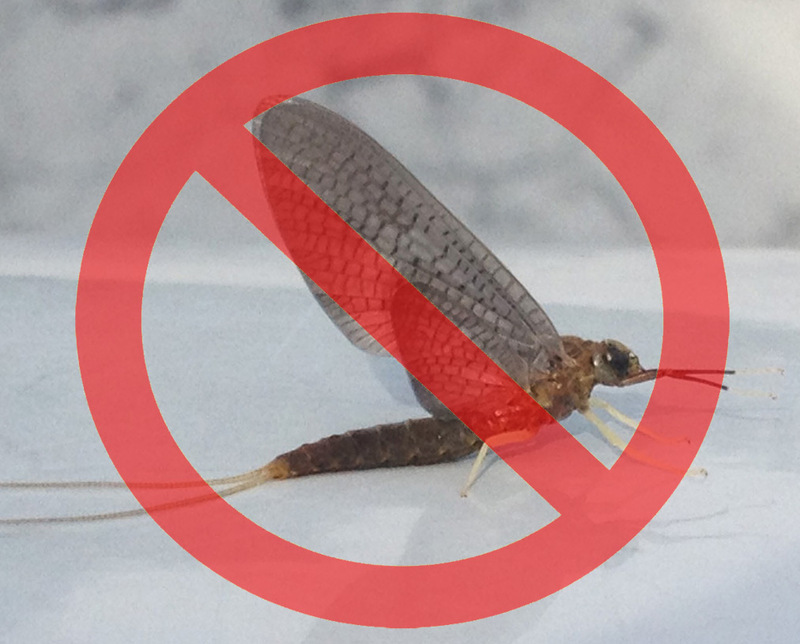 The low pressure should be a boon for bugs, especially as the clouds thicken throughout the day, so be ready for olives and fish actively eating them! It turned out to be a pretty good day out there yesterday, despite the sun baking the water for the majority of it. 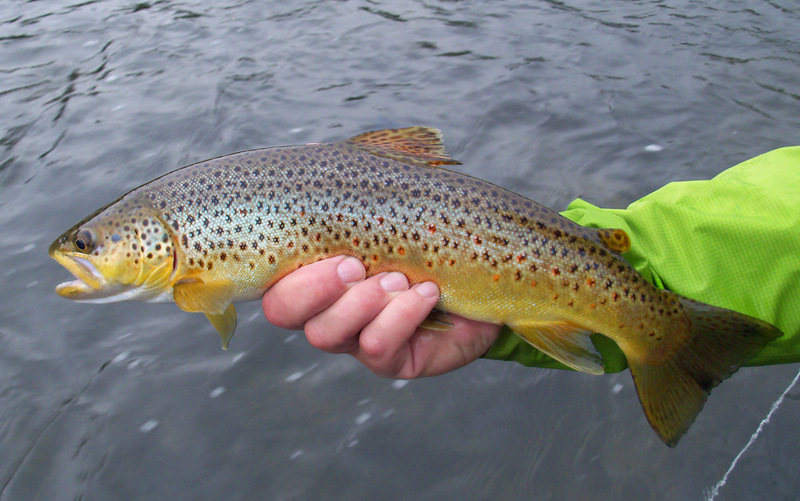 Tricos did come out, and those on the bigger pools had good luck with them, and as the clouds rolled in yesterday evening, we had some great Olives coming off, as well as sporadic spinner falls that both fish and fishermen were happy to see. 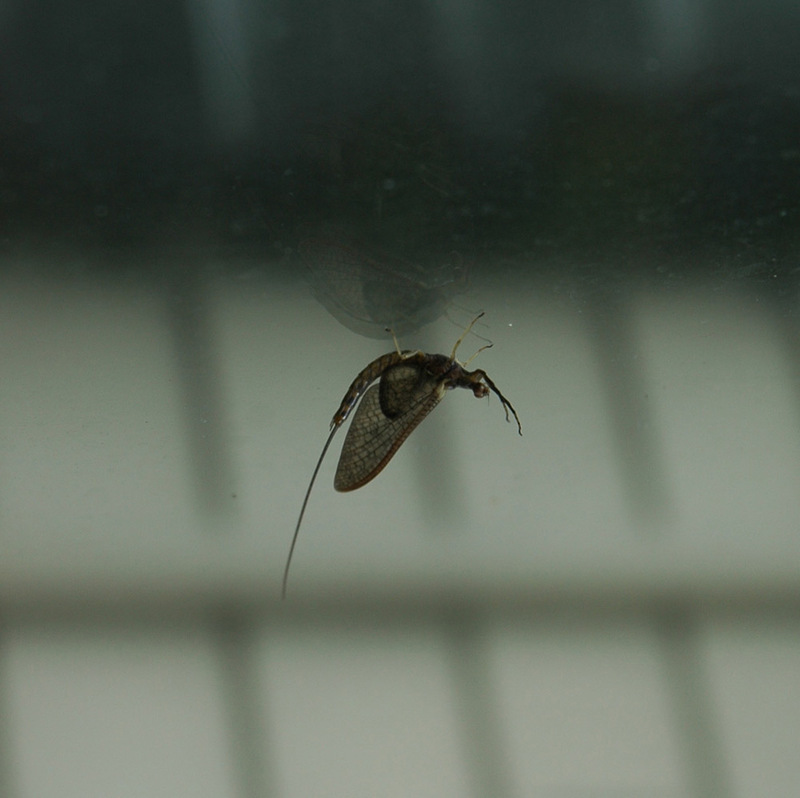 Today, they are calling for an AM thunderstorm, and mostly cloudy and humid – perfect bug weather! A little bit of rain won’t hurt either, as it will definitely keep our water temps down where we like them, revitalizing the East and the Main (which should start to fish again in the very near future). Some pressure changes throughout the day will likely mess with the hatches some, but the heavy moist air should balance it out nicely! 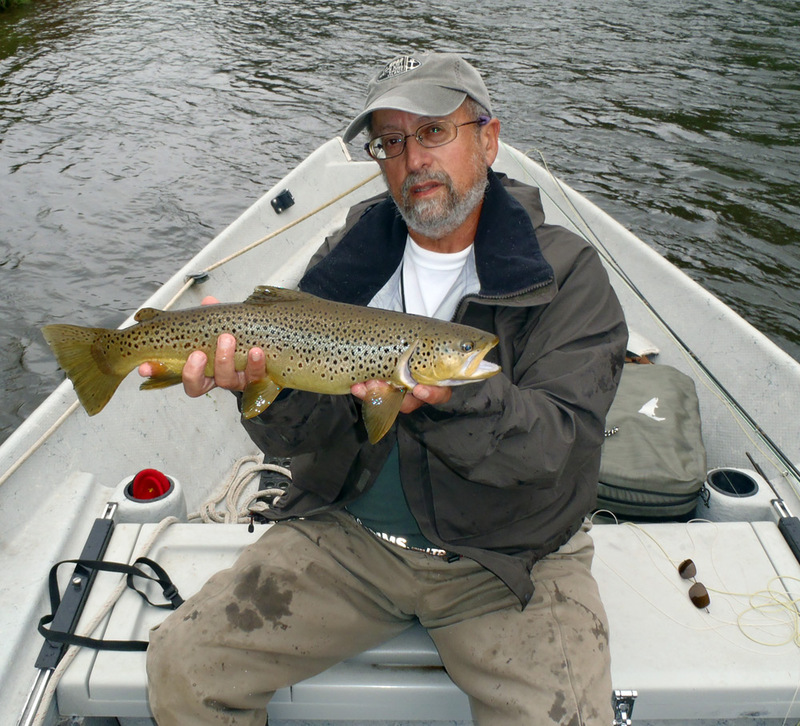 Dave Price holds a nice brown aloft that he caught this past weekend – they are getting colored up for the spawn! Photo by the angler. Man did that wind blow yesterday. Gusts up to 30 or so, with more regularity than I would like to admit. It did lay down in the evening, but those fishing subsurface during the worst of it had a great time with eager rainbows ready to eat. We had Olives in the evening, as well as a smattering of hebes, stenos, and the occasional Iso. The bright sun was not a big help, but the wind did blow some flying ants into the water in spots, and the fish were definitely eager to take those. Today we are looking at a much calmer day wind-wise, as well as temps in the low 70s, with “partly cloudy” skies. If those clouds ever decide to thicken, we will likley have some good afternoon action. Otherwise, the evening will be the way to go! Well it finally happened to me last night. I couldn’t make them eat an Iso. Typing those words is more than painful to me, as I have enjoyed fishing little other than Iso comparaduns and parachutes for the last three weeks. The fish woke up and realized that BWOs were a viable food source. Actually, they realized there were plenty of food sources – we had sulphurs, hebes, stenos, (occasional Isos), as well as olives in everything from 18 to 22. It seemed that each fish was on something different however, even in the same pod – one woudl be on sulphur spinners (plenty out in the evening #16), the guy right next to him wanted psuedos (#22) and the fish adjacent was eating hebe duns (#18). But no one was eating Isos. Sigh. Today, it is supposed to turn sunny and breezy as the day progresses, which means we will see fewer olives during the daytime, but the likelihood of ants will increase pretty dramatically, so keep your eyes open. 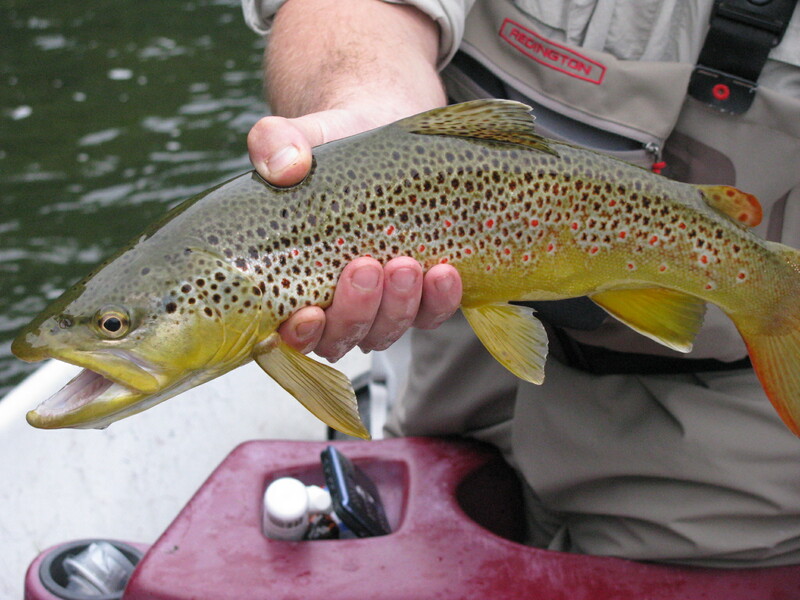 Warmer water temps also mean the hatching should go right up until dark (As it did yesterday) – so be ready! Tough day out there. As a friend put it, it was a “Big Sky Day” – lots of bright, warm sun during a day that felt cold when you were out of it. With the sun, there was not a great abundance of activity early on in the day, save for some nice big Trico flights in Home Pool, Methodist Pool, and Junction Pool. 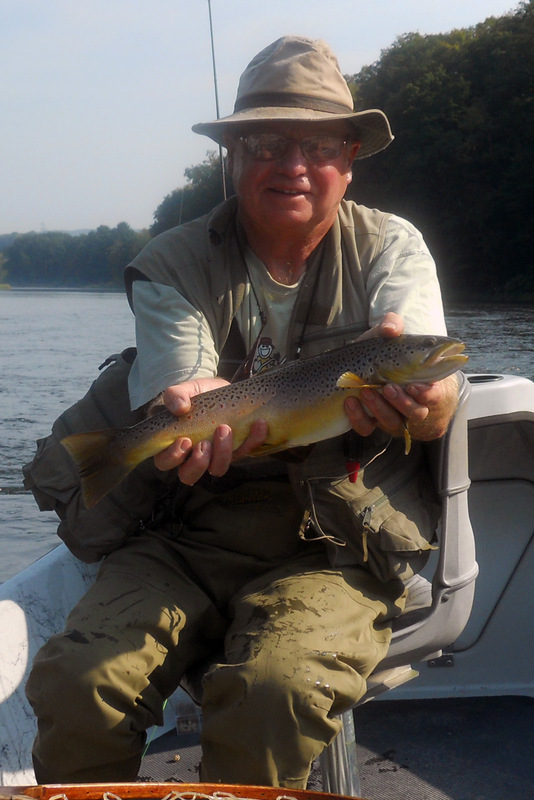 Not many fell on the water, but it definitely provides a reason to head out on the water around 9:30 – 10:00 AM. Otherwise, there were decent flushes of bugs here and there from Hale Eddy all the way down to Buckingham, and while the fish were only up sporadically, they were definitely eating and catch-able if you could put a cast over them in time. Today, we’re looking at warmer weather, with the possibility of some showers as well. The additional cloud cover coupled with the warmer air temps definitely bode well for hatching, and we should certainly see more day-time action as well! Windy! That is definitely what yesterday was, but fortunately only in bursts, unlike what was predicted. The oddball aspect of the day was the hatching – it was pool-to-pool, instead of river-wide. Certain sections would see great flushes of stenos, hebes, and BWOs, but move just a few hundred yards downstream, and there could be nothing happening at all. The fish were definitely up in the evening, but only steady in those areas with the aforementioned heavy flushes of bugs. The Main Stem was cool all day (water temp wise) and it showed, with a bit more consistent hatching than the West Branch. With incredibly cool overnight temps (it is only 41 at the club as of 7:45 AM), the Main and the East will start to fish again in fairly short order. The West will take a little while to heat back up this morning, so don’t rush out on the water – with partly cloudy skies, and temps under 70, it may take awhile for the bugs to kick in, and the fish to start looking up for them! It was opposite day yesterday evening – when the sun was out, there were bugs, when the shade hit the water, the bugs disappeared. Up is down, left is right, cats and dogs, living together – mass hysteria (kudos to all those getting the last reference). There were a few isos out, as well as some larger (#18) olives, and fish were very sporadically taking them, with barely visible sips. Definitely catchable if you could put the cast over them quick enough. The daytime was pretty quiet, even on the subsurface front, likely due to the high pressure system that moved in during the afternoon. Today, we’re looking at cooler temperatures, variable cloudiness, but definitely some wind thrown in throughout the day which will make things interesting. The pressure is slated to remain steady at least, so hopefully the bugs will be active during the day, and certainly during the evening as the wind dies down as well. The river definitely cleared up yesterday as we thought, starting upstream and working down. 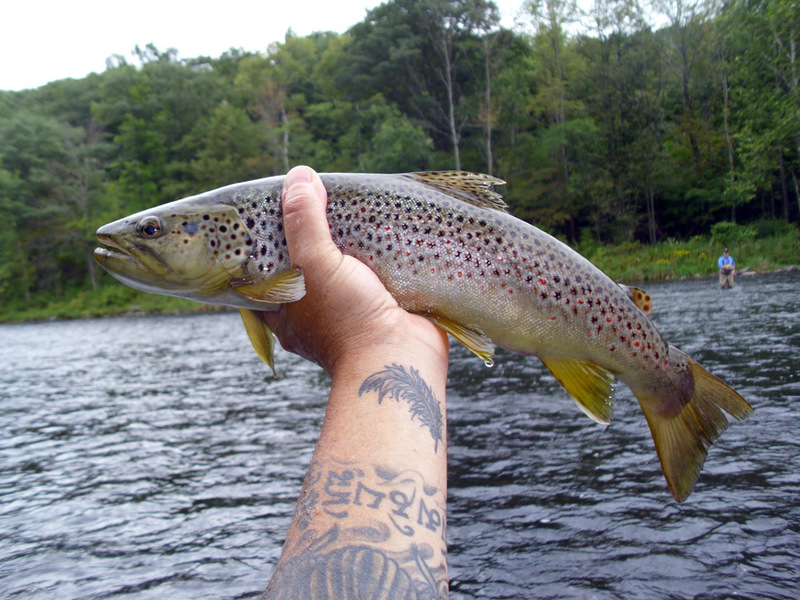 Cloud cover throughout the day did produce some good hatches in various spots throughout the river, albeit spotty insofar as timing went. 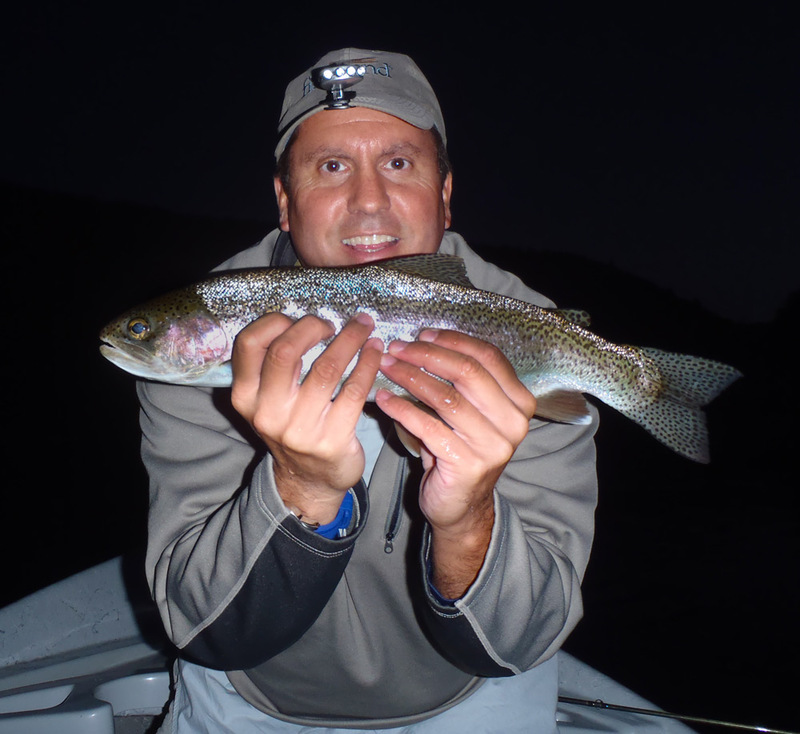 The evening saw the wind come up a little bit, which pushed some of the smaller olives off the water early, but there were flushes of stenos and isos to keep the trout at least looking up. Today the water temps are starting much cooler thanks to our cold overnight, but we are expected to get up into the high 70s today – our warmest day of the week, with the witchdoctors calling for “sunny and pleasant” – not the best for daytime fishing, but there should be some trico activity this morning, and I would fully expect some very nice hatching in the evening as well. Hope everyone had a great holiday weekend! Now, take a look at that graph below – it could be the path for a new roller coaster, or it could just be the West Branch flow at Hale. Pretty crazy huh? We actually got quite a bit of rain last night, but it appears the majority hit the reservoir and the East Branch Basin (which is currently ripping). We are definitely up, but are by no means blown out this morning (at least across the street). The river is already beginning to fall, so we will likely have a good day here today, especially if the cloud cover persists. The fish have finally realized that the small olives are actually food, and as such those fishing BWO emerger patterns have been doing pretty well. There are still ants about, and the Isos have not taken a break yet either. We have a little more rain in the forecast today, but it doesn’t look like it will affect the flow / river color – just make the olives happy!